Trees reflecting on beautiful Forlorn Lake in Washington State's Gifford Pinchot National Forest near Mount Adams. Relaxed feet dangle off the edge of a water craft. I wanted to get away from normal life for a few days and zeroed in on Goa as my hideout after reading various traveller accounts on the serene countryside. Two of my friends decided to join me, one of whom had a house in Vasco lying vacant (let's call him House Owner Friend or HOF). The other, let's call him Beardy since he has a beard for a face, was gracious enough to take time out from his busy schedule to join in. Since we'd decided that this would be a Goa-on-a-shoestring-budget trip, Beardy decided to travel by train, going in for general or second class tickets. He was mighty pleased with himself since he'd booked the journey from Bangalore to Goa and back (via Kerala, his hometown) for under Rs 1000. Although I felt a bit guilty for choosing to fly in from Mumbai, there was some consolation in getting a cheap flight using a combination of payback points and a MakeMyTrip deal. When I reached Goa, Beardy was there to pick me up, having arrived earlier that morning (I thought he'd be caked in grime and sweat after his train journey but he was bright and shiny, likely due to the protective qualities of his beard). Meanwhile, HOF had done some jugaad and arranged for us to use his friend's car for the duration of the trip. So, there we were, with three days on our hands and a resolve to seek peace and tranquillity away from the usual Baga-Calangute-casinos tourist circuit. Vasco (short for Vasco da Gama; named after the famous Portuguese explorer), a port city and naval base, is pretty low on the list of most visitors (especially when Tripadvisor lists "Vasco's Municipal Market" as one of the top 5 places to see here! ), but we found that it's actually a beautiful little city strewn with hidden gems. 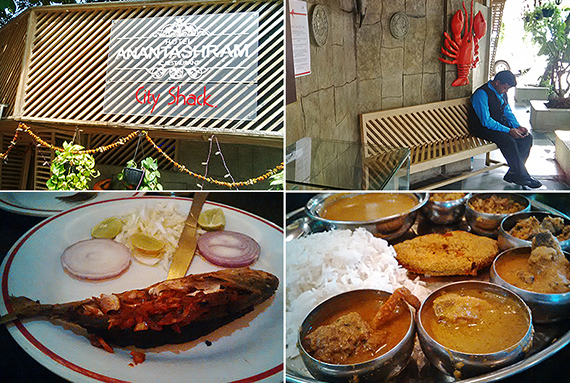 The first of these gems was a restaurant called Anantashram (unlikely name for a Goan non-vegetarian restaurant! ), where the special non-veg thali was out of this world -- so fresh, delicious and at Rs 300 in line with our shoestringy budget. The normal non-veg thali (with a few sides, one fish curry and one fish fry) is just Rs 80. We kept going back there for more every night. I have always been a fan of Goan fish curry (Mamma's Kitchen in Panaji is where I had it first), and Anantashram's version is by far the best I've had. We also tried the mackerel reshad (reacheado), red snapper (chonak) Reshad and chicken vindaloo during our subsequent visits. If you ever stray into to Vasco, hunt down this place and try the fish. If you don't like it, your next meal's on me. The other gem you should definitely visit is a bakery named Temptation. The chocolate-vanilla rolls and bebinca (a Goan sweet) were lovely. 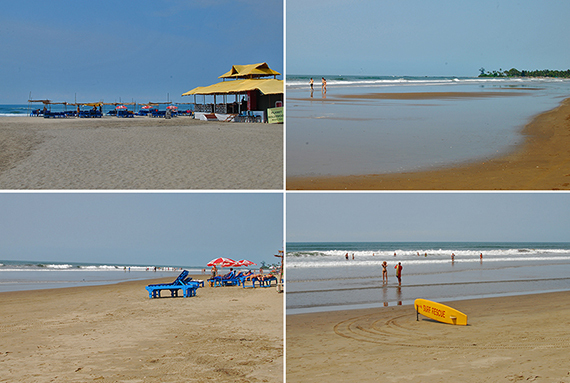 Another highlight was Bogmalo Beach which we visited towards late evening. We had our dinner from Joet'son the beach. The fish fingers, made from sardines (who makes fish fingers using sardines?!) destroyed the evening for us, but then some of the other dishes we had salvaged it to some extent. 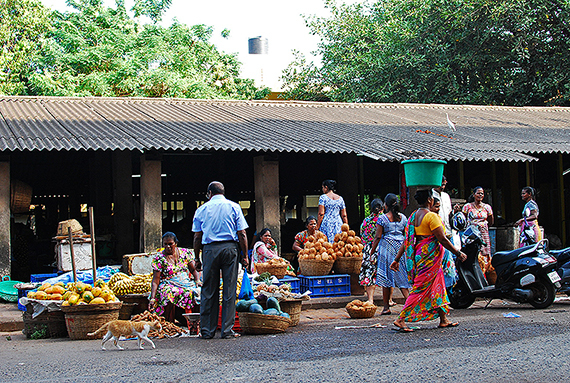 The days I spent in Vasco also led me to believe that Goan women are more hardworking than men. Now, I may be wrong here, but I say this because I saw more working women than men in Vasco -- selling stuff in markets, transporting heavy loads by balancing sacks and buckets on their heads, running eateries, baking cakes and bebinca, or just plain bossing their husbands. That night, unfortunately, Beardy received a phone call that upended his plans. It was his tenant calling from back home, saying that the house was flooded due to incessant rains in Bangalore. He quickly booked a flight (there went his shoestring planning! ), remarking like a true optimist: "On a brighter note, it's not every day that I get to do a 15-hour train journey just for dinner." Driving is what relaxes me the most. I sometimes wonder whether I should have pursued my childhood dream of becoming a bus driver. 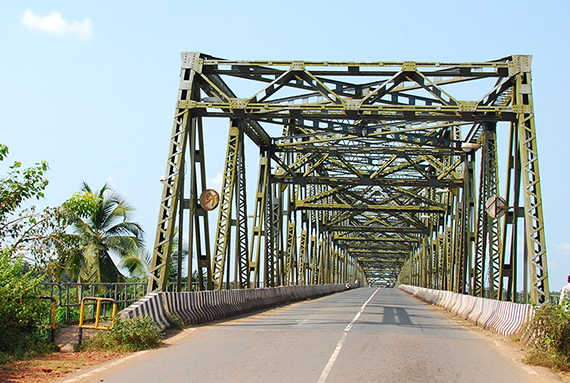 We were driving up north, with a rough intention of seeing some of the beautiful beaches of North Goa. Driving through the hinterlands was a fresh and beautiful experience for me. 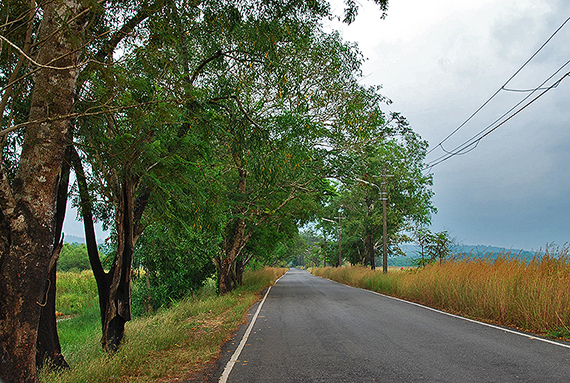 The roads in Goa, unlike those in many other parts of India, are very well maintained. Many new bridges that have come up in the past few years have connected the interiors and islands better by road. 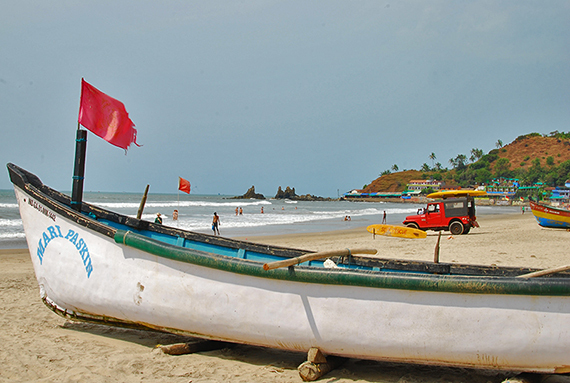 We soon came upon beautiful Morjim Beach, its white sand glittering in the bright sunlight. There were only a few people around, mostly foreigners, either resting on wooden beach chairs or in the water. Morjim Beach is also a nesting and hatching habitat of the Olive Ridley sea turtle, an endangered species. 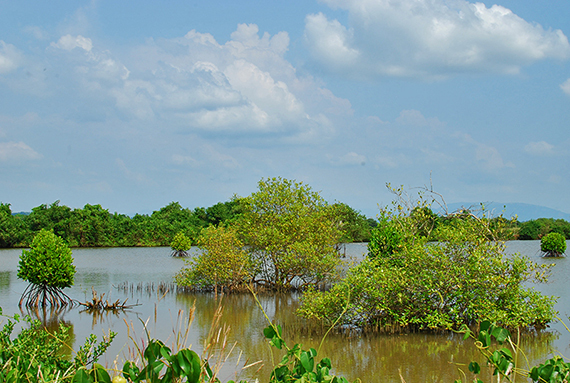 You can see the Forest Department's turtle conservation centre at the entrance of the beach. Further north is Mandrem Beach, which we skipped and continued on to Arambol Beach, considered one of the most beautiful in Goa. Unlike Morjem it was not very crowded but had more shacks/eateries lining the beach. We had lunch at a nearby joint, at the entrance of the beach (just outside the car park). The food (again, centring on fish), though a bit oily, was fresh and good. The eatery had posters of art and yoga pasted all around. These beaches up north, as I could see, were more about relaxation, peace and tranquillity. We wanted to drive to Querim (Keri) beach, the northernmost beach of Goa, but the heavy lunch made us lethargic, and we decided to lazily make our way to Chorao island. 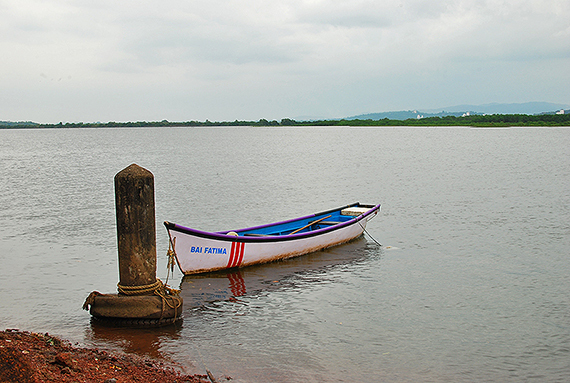 Chorao and Divar islands should be on your itinerary if you want to get a taste of the picturesque settings of rural Goa. Our drive through Chorao village gave us beautiful views of green and yellow paddies, small white chapels, brightly coloured Portuguese villas and some thatched houses. We also intercepted one of the famous cycling Goan bread sellers, and sampled some pois. 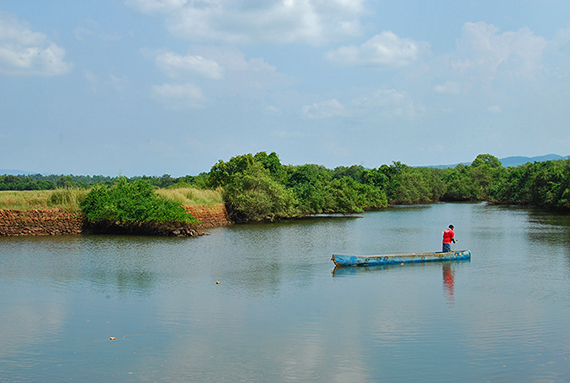 Chorao island is also home to Dr Salim Ali Bird Sanctuary, Goa's one haven for birders. 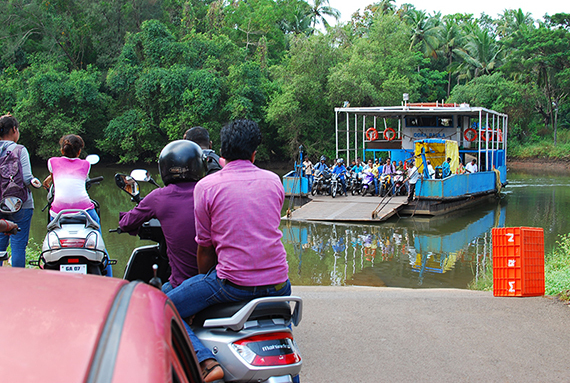 We took the ferry to Ribander before driving back to Vasco that night. 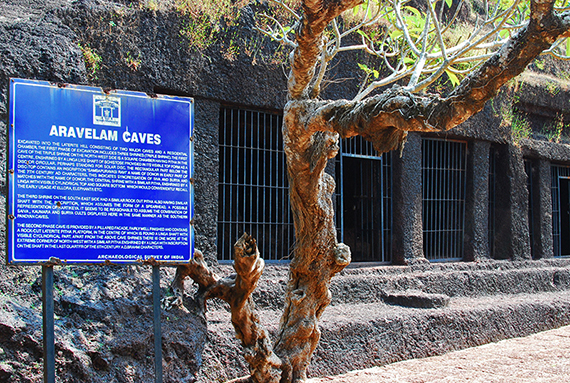 The Harvalem Caves, also known as the Pandava Caves, are protected by the Archaeological Society of India. 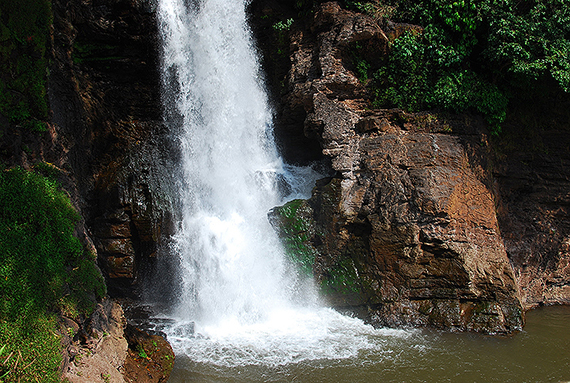 Believed to have given shelter to the Pandavas, this cave has many chambers carved into a laterite hill. Further down is the Arvalem Waterfall, which to me, made the trip to this place worth it. 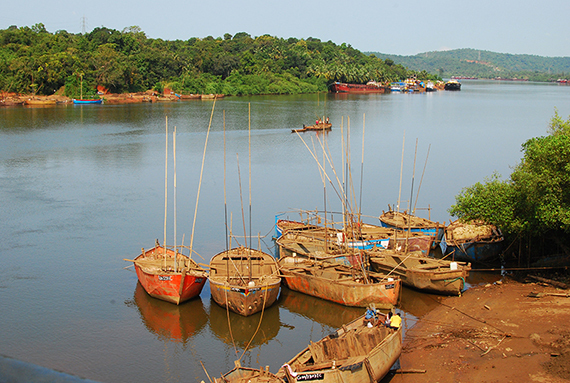 Cumbarjua canal is the only place in Goa where crocodiles can actually be seen in the wild. We did drive to the small village of Cumbarjua, but failed to find someone who could take us into the canal. Asking around with the locals didn't help either, and so we had to abort this mission. 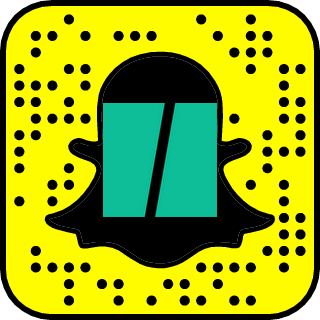 I'll probably return for this experience, probably with these people. I spotted what looked like a rundown church while on the ferry to Divar, and as soon as I landed in Old Goa, I decided to see this place up close. 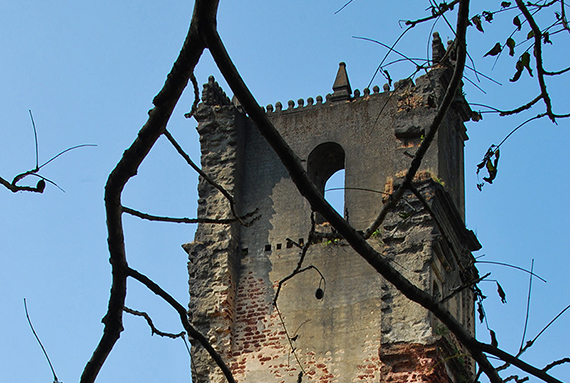 The structure that I'd seen was the ruins of St Augustine's Church, which is located very close to Bom Jesus Basilica. The church, now in complete ruins, gave me the creeps especially since there was not one other person in sight. Three days driving through the hinterlands, experiencing Goa's sunny susegad did give me what I came looking for: a bit of peace and calm. 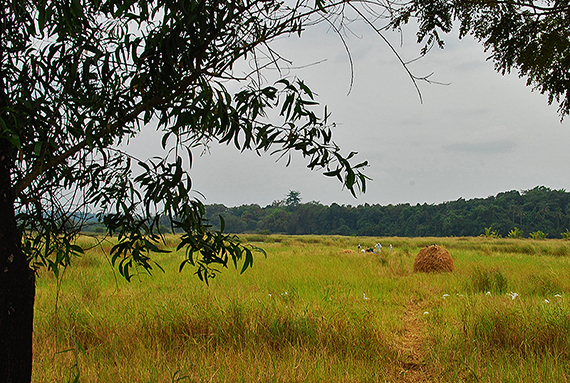 This is the side of Goa I want to explore again, perhaps on my bike.